“It just feels like you’re eating a piece of the sun. It’s so cheerful; it makes me happy in the morning,” said Kat Vorotova, co-founder and co-CEO of Try The World, a bi-monthly subscription box that allows you to sample difficult-to-find products from around the globe. One of her favorite discoveries, a clementine jam from Corsica by Charles Antona, is made from a special species of clementine that only grows on the island—and the fruit used to make the jam is sourced from Charles Antona’s orchard. Vorotova and her co-founder, David Foult, met when they were in graduate school at Columbia University. Try The World, born out of their love for food and travel, was started in February of 2013—before they graduated. The team created their first curated box, containing products from France, and posted a photo on Facebook. The response was enormous. Their subsequent growth has been huge, too: In just one year, their subscription base has blossomed from 500 to more than 50,000. The company was partially inspired by Vorotova’s love for Le Palais des Thés, which reminded her of travels to France and Turkey (it was also, fittingly, one of their first partners). Known for its tea blends made from premium ingredients from around the world, Palais des Thés was a natural match for Try The World. “Very few [subscription] companies allow you to taste and discover gourmet food,” said Vorotova. “We’re the only ones that offer international products. Our goal is to become the destination to shop for international food.” Countries were initially chosen by the founders’ personal feelings, and today they are dictated by feedback from subscribers and social media. The economic and political situations in various countries also affect the ability to source products directly. Previous boxes have featured items from Paris, Tokyo, Rio de Janeiro, Rome, Istanbul, New Delhi, London, Venice, Buenos Aires, and Marrakech. 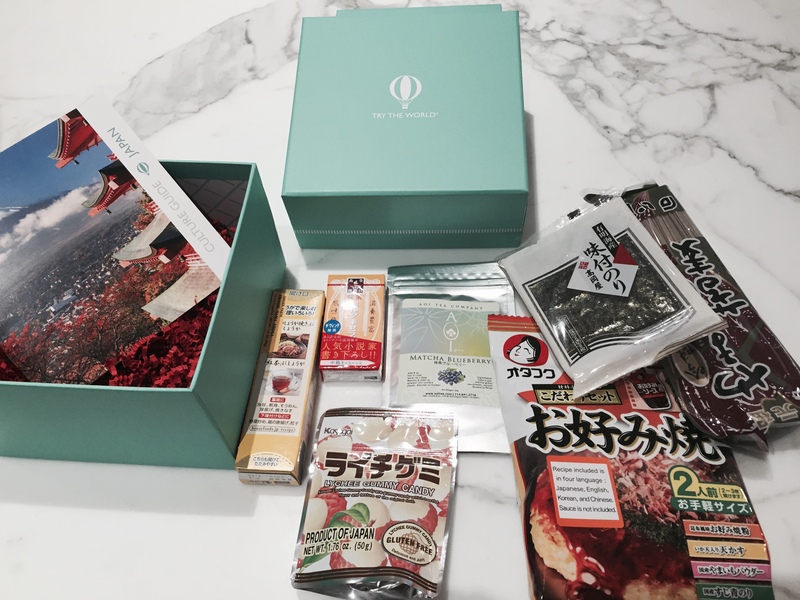 I sampled their Japan box, curated by Chef Chris Jaeckle, which has a mix of sweet and savory snacks and ingredients. Grand Central’s ceiling inspired the cerulean-green color of the box, which Vorotova said reminds her of travel and navigation. Inside, I found a cultural guide to Japan (with recipes) and these goodies: a wild seaweed snack; traditional soba noodles from Hokkaido; milk caramels made from a recipe that dates back to 1899; okonomiyaki, an omelette-like pancake mix; hand-harvested blueberry matcha tea; ginger paste; and lychee gummy candies that are made with fruit juice. The candy was a big hit with my sister-in-law’s 10-year-old daughter, who is visiting from Lake Tahoe. And the dried seaweed brought back memories from my travels in Japan. Find out more about Try The World. And try their Japanese recipes!